Broadsiders is currently a dormant flag on the Cerulean Ocean originally of the Midnight Ocean. It was founded on November 27, 2005 by the crew Wyvern's Pride after they left the flag Carpe Noctem. We're not looking for more allies or crews for the flag at this time. We are currently looking to expand and grow as a flag. 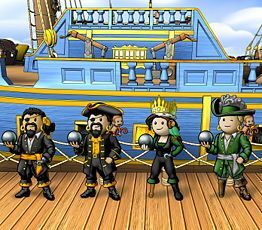 If your crew is interested in joining us, please drop by our flag forums at, www.broadsiders.com, or send a tell to one of our Royalty or Titled members. If you've registered at our forums, please let Napalm, Dolgan or Jaina know so we can activate you.